Two years from now, a deserving family of a United States Military Veteran will be the proud new owner of a beautiful new home that was just built. 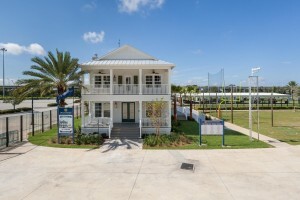 For the time being, though, that home is on display just outside Gate 4 of EverBank Field, home of the Jacksonville Jaguars NFL team. It’s a showcase home for Dream Finders Homes and several trade partners, including USI First Choice Insulation. USI First Choice has been the energy efficiency solution provider to Dream Finders Homes since 2006. This year, Dream Finders Homes is forecast to build over 700 homes, and USI First Choice will provide the insulation solutions in every home. The home is in the Fan Zone at Everbank Field and will be on display for 24 months, before it ultimately gets donated. 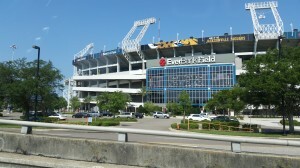 During this time period, over 2.8 million people are expected to visit EverBank Field for events such as Jaguar home games, the Gator Bowl, Monster Truck Jam, Country Music Festival, US Soccer Match, and many other exciting events. Covestro – formerly Bayer MaterialScience – donated the spray polyurethane foam (SPF) insulation used to help make the Stadium Home energy efficient. Covestro worked with SPF contractor USI First Choice to install Bayseal open-cell (OC) and Bayseal closed-cell (CCX) SPF insulation throughout the home. USI applied Bayseal CCX in the crawlspace to help reduce moisture buildup in hot, humid conditions. Bayseal OC is used in all perimeter walls and the roof deck to help reduce air leakage, which can account for up to 40% of the energy used to heat and cool a typical home. Dream Finders Homes will keep the home at EverBank Field for 2 years and then have it moved off-site and donate it to a military veteran. Several of DFH’s trade partners, including USI, all agreed to donate all labor and materials for this effort. Euneil Perez, Christian Reed, and Juan Perez all volunteered their time for this project. USI is honored to be a partner on this project. 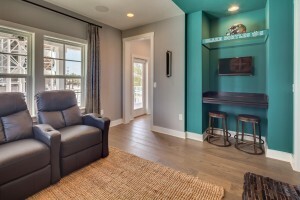 For more information about the home and to see more photos and video, visit the Stadium Home website.